Gemini are cognitive, educated and well-read! Gemini (sign: ♊), as well as both other air signs, is the fastest one in acting, thinking and doing. However, they are the most tolerant zodiac signs in general. 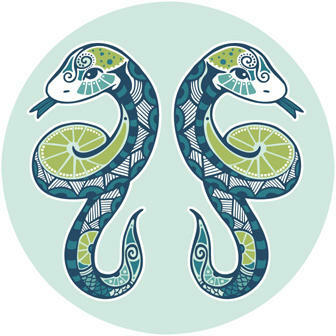 When there is no trouble Gemini is open-minded and open-hearted as well– Gemini is loyal and honest - diplomatic, but talks in a direct way and so often not easy to handle. Gemini confronts, and most of the time Gemini finds conflicts. They are unintrusive and apply lingual fluency and skilled communication. Great talent to start conversation and pep up tired situations and parties. They bring society back to life - they are energizing and self-energizing. They need applause – if not they become annoyed. Maybe seldom they appear in a wicked way – in general, they never show their side in society – and they do not like showing their other dark or negative side in public – they like to present themselves at their best, and they are imaginative most of all. They prefer to represent their bright and humorous side and just when there is trouble or injustice they turn to currish behavior. They have turned to their distinct part and could show various images. To wait – to be patient – stay and retain is not their part. They are agile and skilled within large context and connections: Thinkable striving on their way. But conflicting with the different zodiac air signs they are cautious somehow. They are doubtful as well, and maybe they tend to lose the earth beneath their feet - but they always want to get up again and stand on their own feet. Gemini persons are heartfelt and proud. As it was they are interested in everything and ask and require lots of questions – they change and innovate but are bright and polite as well.